Seasonal landscaping adds festive elements to your outdoor setting, while seasonal interiorscaping uses indoor plants to add a holiday touch. Foliage Design Systems installs and maintains interiorscape holiday décor and seasonal displays in Palm Beach and other cities throughout the southeast coast of Florida. We use colorful plants and flowers to add elegant holiday touches to your interior. With lots of rich greens and vivid reds available in thriving indoor plants, it is easy to add festive holiday plants to any area of your home or office. Bromeliads blossom into brilliant red flowers surrounded by thick green leaves, making them perfect for an island-style holiday. Snowy white orchids with light green leaves are a paradise substitute for a snow-covered Christmas tree. Unlike faux pines, they are real plants that will not gather dust or bring down the elegance of the décor, nor will they wilt or fade in the climate. We can also arrange traditional poinsettias—a plant originating in warm, tropical areas—in red, white, or pink to suit your holiday décor. 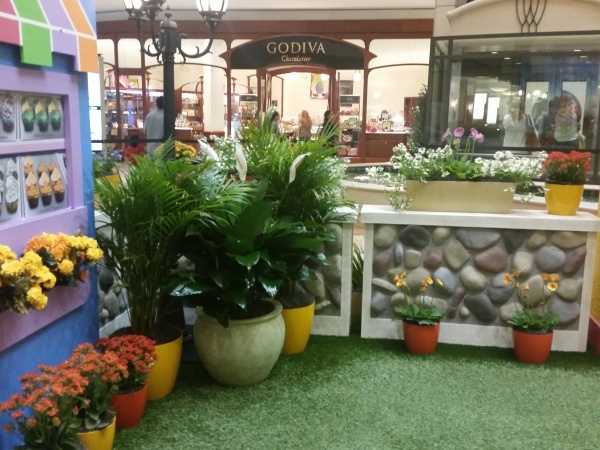 We offer fall and spring displays too – including commercial Easter displays – full of beautiful colors and blooms. To keep all of your interiorscape foliage looking healthy and beautiful during the holidays and throughout the year, we also provide regular maintenance services. Naturally we offer replica holiday items too – professionally decorated with one of our signature themes – or we will customize a theme for you. We offer multi faith displays too. If you can dream it, we can create it. Ask us how today! Learn more about interiorscape holiday décor and seasonal displays in Palm Beach to brighten your home or office with live plants. Are you a part time resident, we also have packages just for you. Contact us @ 561-784-5040 for more information.